Preheat grill to medium heat, about 350 degrees. Place whole jalapeno on the grill along with a quartered red onion. Grill each side of the jalapeno for 3-4 minutes, until you see char marks. Do the same for the red onion. Remove from grill, slice the stem of the jalapeno off, remove the seeds (unless you like it hot then keep the seeds in). Add jalapeno, red onion, garlic clove, lime juice, fresh cilantro, ground cumin, smoked paprika, and a pinch of salt to a small food processor. Blend until the mixture is smooth. To a small bowl add greek yogurt, and 2-3 tablespoons of the roasted jalapeno mixture. (depending on how much heat you can handle). Gently fold them together. Set aside. Add corn directly to the grill. Grill each side of the corn for 3-4 minutes, until there are char marks. Remove the corn from the grill. 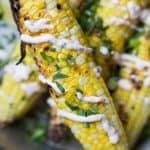 Rub about 2 teaspoons of the creamy roasted jalapeno sauce all over the corn and devour!